I went to see a school recently to talk about having a mural painted. The head took me to the hall where he showed me a woodland mural that looked like it had been painted by young children, unsupervised. To be honest, my first thought was that at least they hadn’t paid for it, because in truth it was awful. The colours were not co-ordinating, the perspective was all wrong as was the scale. The painting wasn’t a good quality and some of the trees actually looked quite scary. The saddest part of this story is that he is not alone. Many schools, trying to stretch increasingly tight budgets, take up offers from willing parents to help them with projects like murals. Sadly, more often than not, it ends in disaster. Whilst the story above is bad enough, I met another Head who allowed a parent to paint a school mural in the school holidays, they had an accident and spilt paint all over the wooden floor. Because the parent had no form of insurance, the school were left with a hefty bill to replace the wooden floor (as it happened, because the floor was quite old, they struggled to find a good replacement, so were left with the options of replacing the whole floor, or putting up with a patch in a different colour. They went with the latter and now that is all you see when you walk into the room, it detracts from the mural completely). 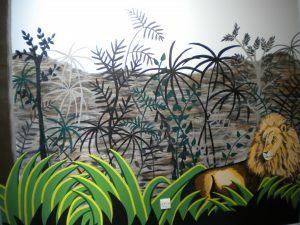 Rousseau inspired mural for Lion class. In these days of budget cuts, it is understandable that schools take the opportunity to save some money if they can, and I applaud that, but as someone who has had to sort out the aftermath of a less than successful mural project, here is my guide to ensuring you are protected in this situation. Make sure that you see some examples of the person’s work before they put brush to your wall. Showing a nice piece of A4/A3 work is no guarantee of being able to paint a mural. Make sure you see some photos of murals, or at least large scale art they have done, so you can reassure yourself they can actually do the job. Agree up front what is going to be painted. Get them to draw up their/your ideas first so that you can agree what you like and what you don’t. There shouldn’t be any surprises. 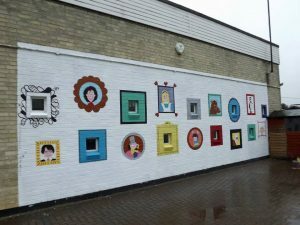 If the mural is to be painted in term time, get them DBS cleared and ensure they have a copy of your safeguarding policy and that they agree to stick to it. Put together an agreement that states if the mural is not satisfactory, then they will make it so, or paint over it and restore the wall to it’s previous state. They MUST have Public Liability insurance, and £5m of it. It is possible for some schools to get parents covered on their own policy, but check this first. If any accidents happen, you have to know you are covered. If all of the above can be done, and you are confident that you have hit the jackpot and got yourselves a mural painting parent, then go for it! I have seen a few beautiful ones painted by parents, however, I have seen far more disasters. When you engage a professional, not only are all the necessary safeguards in place, but if you do not like anything, you can, without fear of offending, get them put right and get yourselves a piece that you will all be proud of for many years. 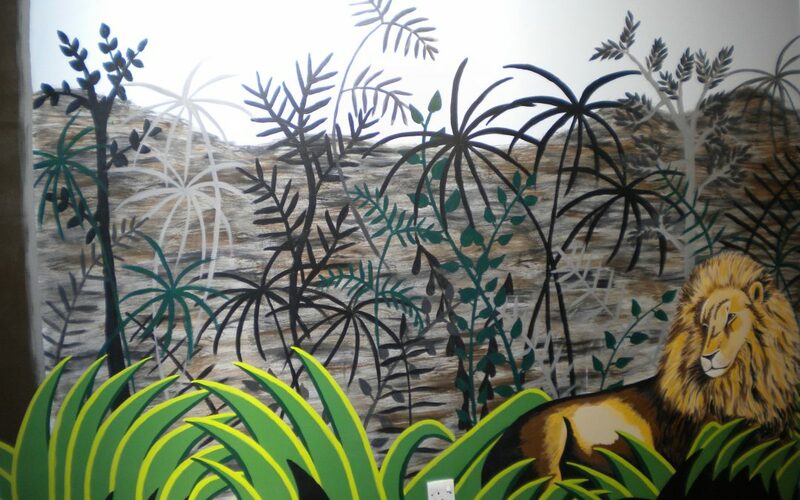 An experienced mural artist will also be able to incorporate many elements, so that your mural ticks lots of boxes and makes the best use of the space and your overall objectives are met. We are also experienced at including your students in the project, so that they have buy in to the mural and gain some benefit from being engaged in the design and/or painting process. Having a mural painted by a professional is usually much less expensive than people realise, and given the potential outcomes of leaving it to parents, can save you lots of money in the long run. And of course, it is so much better than counting down the days until you can get rid of it!